Alvarez was subsequently arrested later that day after unloading the 800 pound steel spoon, one of his first acts of “guerrilla art” in what he plans to be one of many unauthorized protests against the pharmaceutical corporations. 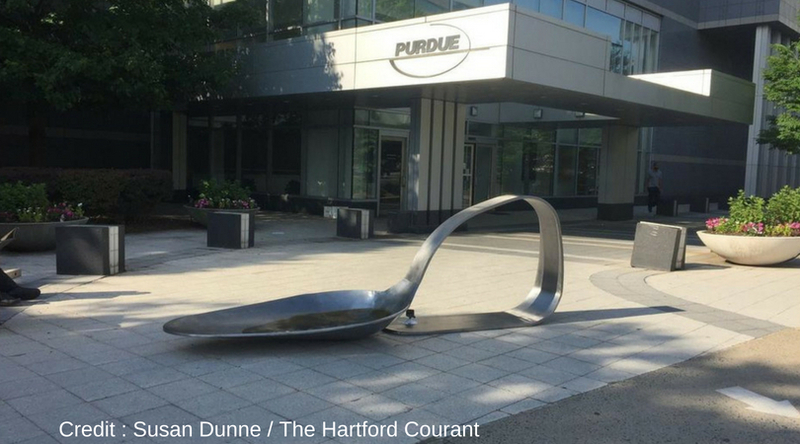 Stamford art gallery owner Alvaraez calls his campaign the “Spoon Movement.” The sculptures’ creator Domenic Esposito, a boston artist, has a personal connection to the movement, his brother’s opioid addiction began with OxyContin and Percocet. Alvarez was arrested following the protest, and is set to return to court on July 10th, to face his misdemeanor criminal charge of obstructing free passage, which he was charged with after refusing to remove the sculpture. Following his arrest, his movement went viral, bringing his gallery’s opening 1,000 visitors, 600 more than normally seen on an opening night. It was removed by police two hours after it was placed in front of the building. Once the sculpture is returned to him, he plans on donating it to the city of Boston. You can visit OPIOID: EXPRESS YOURSELF at Alvarez’s Gallery, 96 Bedford St. in Stamford, Connecticut until July 30. flalvarezgallery.com.